Physical Description Slightly taller than average, at six feet two inches, and athletically built, Jacob's attention to physical fitness is not easy to miss. He is lean and tone with clear skin and a winning smile. He has a boy next door look that while not overpoweringly attractive still draws attention. General Overview Raised in a family of Starfleet officers, Jacob Aaron Satie learned early how to negotiate the political riptides of the Federation. He graduated from college at age twenty two with his Master's of Law degree from Harvard Law School and immediately applied to Starfleet Judge Advocate Corps. He is driven to succeed and staunchly adherent to the laws that govern the Federation. He suffers from the Satie curse of self-importance and has been known to push things further than he should because of it. Strengths & Weaknesses Strengths: Good eye for detail, legal minded, physically fit, & well schooled. Weaknesses: Arrogant, narcissistic, & over thinking. Ambitions From the time he was old enough to think about what he wanted to be, Jake was destine to be the Starfleet Judge Advocate General. When he lost interest in practicing law he gave that dream up and now is searching for a new one. Hobbies & Interests Jake is an avid basketball player and often can be found on the court in a holodeck where he plays alongside the historic heroes of the game. He also has a passion for language with a repertoire of nearly three dozen. This skill could stem from his interest in law or from his mother who is multi-lingual as well. Personal History Born in 2385, in a time of relative peace, on Earth Space Dock to Captains Michael and Lea Satie. His parents had come through the Academy together and then lost touch for nearly ten years while they were sent off to assist with various efforts surrounding the Dominion War and it’s repercussions. When they met again while serving aboard Space Dock, it was love at second sight. The two were married and nine months later, Jake was born. His infancy was spent between Earth and Space Dock. His maternal grandparents often kept him while his parents were deployed to arbitrate the various issues of the day. When Jake was four his parents returned from a mission to Alpha Omari III, with a baby. Jake was presented with his new brother, Tommy whom he treasured throughout their shared child hood. The two were inseparable until Jake was sent to complete his secondary studies at a boarding school in France. His senior year, Tommy joined him and it was like old times again. The reunion was short lived, however, once Jake graduated he began the course that would shape his career in Starfleet. Harvard School of Law was his father’s idea. Though Jake had nothing against following the family line into law, he was more interested in sports and girls for the first year. He played basketball in the college’s historic sports league as a freshman but was unable to continue through his next four years due to his work load in school. Jake was twenty-two when he graduated law school ahead of schedule by a year. 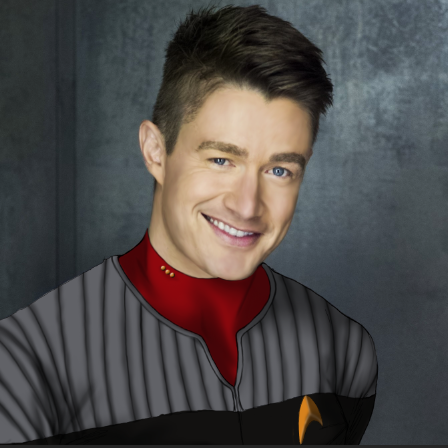 His admittance into Starfleet was immediate and after his initial year of knife and fork school, Jake was commissioned and posted at the 40 Eridani A, Starfleet Construction Yards settling construction contract disputes. He quickly gained notoriety when he used the Laws of Acquisition against the Ferengi trade broker Nos, who had tried to short change a construction project by saying an exact amount of material was not specified when in fact it was stated that material would be supplied until completion of the project. The case while not ground breaking was certainly a rare occurrence for a first-year associate lawyer. Quickly, Jake used the case a springboard to be reassigned to New Romulus, where he worked actively as a diplomatic attaché and intermediary for the Federation and the fledgling Romulan Republic. While there, Jake was promoted to lieutenant and served as Legal Adjunct to the Federation Ambassador to New Romulus. After his three-year stay with the Romulans, Jake was reassigned to the Sol Sector, Attorney General’s office. Shortly thereafter he was promoted to commander and made lead prosecutor. Three days later, Jake received word that his father had passed away from an untreated aneurysm. The following year was the best and worst of Jake’s life. He met another young hot shot lawyer named Rosaline Yates. She had been his whole world or at least when he thought of his future it was being shared with her. She had seen things differently. She had mistaken his dedication to his career as his only passion and felt she had been delegated to the status of trophy. When Jake had asked to marry her, she refused, and then his world fell apart. The next day he had submitted his paperwork for transfer to the command pool and given the Corps his notice. * 241710.01 Transferred, Cold Station Theta, Starbase-1170, Executive Officer.